hello how are you? Well I have been so busy creating lately but I cannot share much of it yet which is a shame but it will appear on here in the end. AND I have made my Christmas list(yayeee). Top of it is the new Lightroom software to help me sorting, editing and sharing my photos on the web LOVE IT and I will be such a good girl from now till then LOL> I am currently using the free trial version and I love it sooo easy( Yes Leigh is all your fault). So what I have been working on lately? 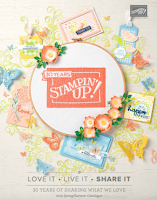 Tons of swaps, I love samples and my customers love samples as well, so I have joined a few organized swaps on ILWS. The most exciting one is a catalogue swap where 10 of us chose to CASE samples from the catty. I couldn't pass on that one and I ended up joining two groups. This is one of the cards I chose to case the other you can see on page 57, unfortunately I forgot to take a picture before I have sent them off. Is the cherish one and it features a favourite stamp set, Baroque motifs. Back to the ones I have taken a photo off, like a breath of fresh air after all the Christmassy projects I have been working on lately, although I have spent some time today working on Valentine !! Tempting Turquoise , Rose Red, Choc Chip, Certainly Celery and a touch of Pumpkin Pie makes it for a joyful colour combination that just screams fun. 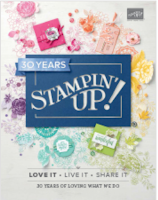 I choose this one because of the stamp set, Big Bold Birthday has to be one of my favourite stamp sets ( I like it even more than the Crazy For Cupcakes*shocking I know*). I tweaked it a little bit but on the whole kept with the same layout and colours, well it is perfect as it is. 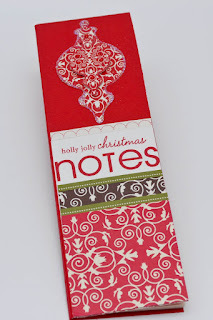 Now you might remember I told you in my last post about longing for a pretty Christmas planner. Well I can tell you that I am the luckiest girl out there. 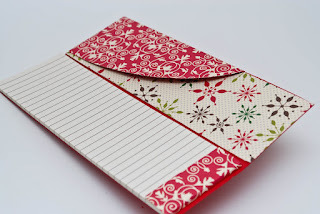 Dawn one of my gorgeous Passionette took pity on me and sent me this beautiful, beautiful planner. Isn't it just perfect? I love it and I jumped around when it arrived on Saturday. I couldn't believe that someone took time out of their busy schedule (because lets face it we are all in our 5th gears this time of the year) to make ME something as beautiful and useful as this lovely planner. I was very touched indeed thank you so very much Dawn, I cannot wait to meet you and Mick on Friday and thank you properly. Here s a picture of the inside, it even has a pocket for all the receipts, sooo sweet. I can tell you that I have spotted the products Dawn used on it in case you're wondering. In fact it was so very easy as everything she used comes out of the fabulous Christmas Jingle kit. It is just incredibly versatile as well as being very beautiful. Now even though I am working in advance (for those that know me well YES this might be the first time ever that I have actually done that, so stop snickering) I am still busy with Christmas makings and while browsing blogland I have come across this lovely blog where Stacey a fellow demo posted the sweetest choc wrapper I have ever seen. It is so very cute I was totally inspired to make my own version and share it with you all. 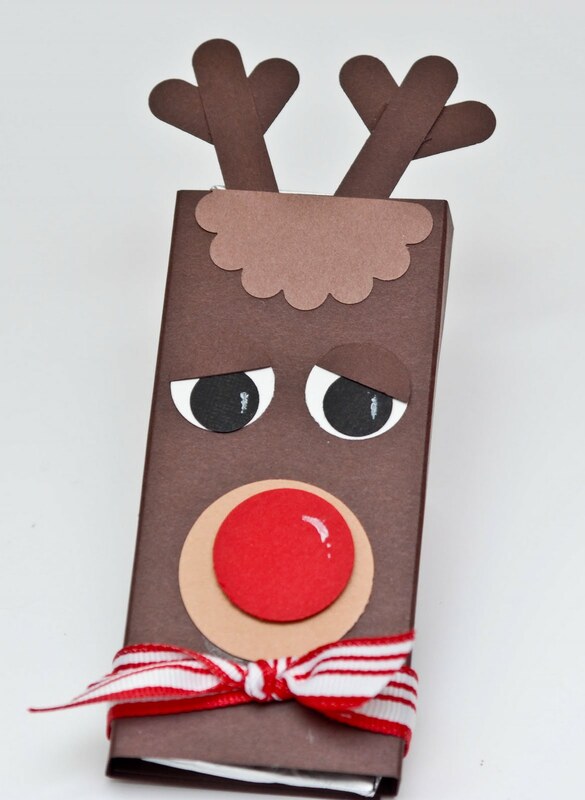 I have modified it a bit and made his antlers using the Word Window punch instead of the pipe cleaner. I didn't have any brown ones and even if I had I think it would have been a bit more work trying to make it into shape. This way it literally only took me 2 minutes to construct. Fabulous for those craft fairs as well. I love our punches they are great used for so many things other then what they were designed for. Ok bed is calling me so thank you for stopping by see you again soon. So cool, love that planner. Beautiful creations Monica. I particularly love the reindeer choc cover! 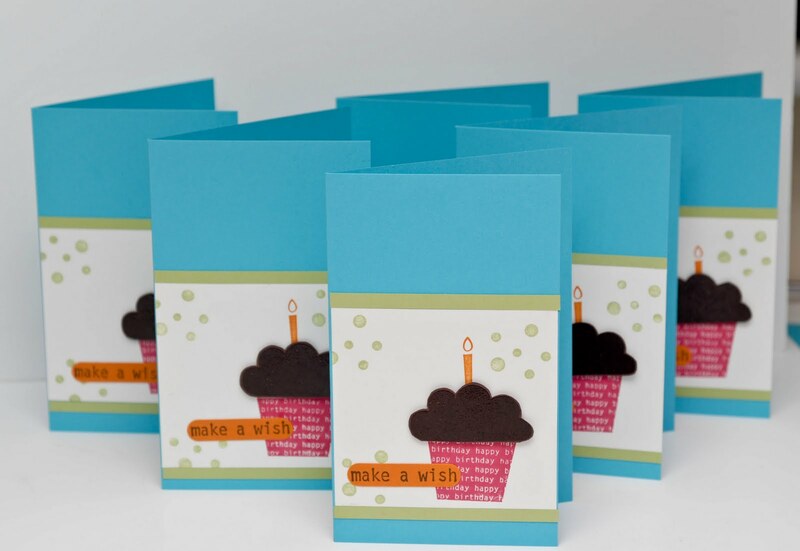 Ooh love the bold birthday cards, of course! What did you do with the brown on the cupcake, did you stamp it in brown a second time and cut it out or is that brown card you've cut to the same shape? Lovely! Glad you liked the planner, I really enjoyed making it/them, I haven't stopped making them - I think it's become a bit of an obsession now! The planner is lovely, lucky you. The birthday cards are fantastic but the chocolate wrapper WOW. Stunning. I dont know how you find the time to do all you do. What a great idea to use the word window punch! Great Reindeer. 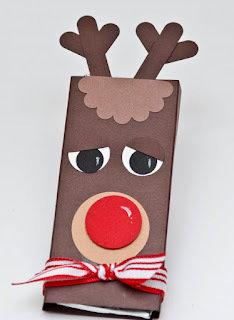 Wow fab creations as always monica, that Reindeer is amazing, love it.